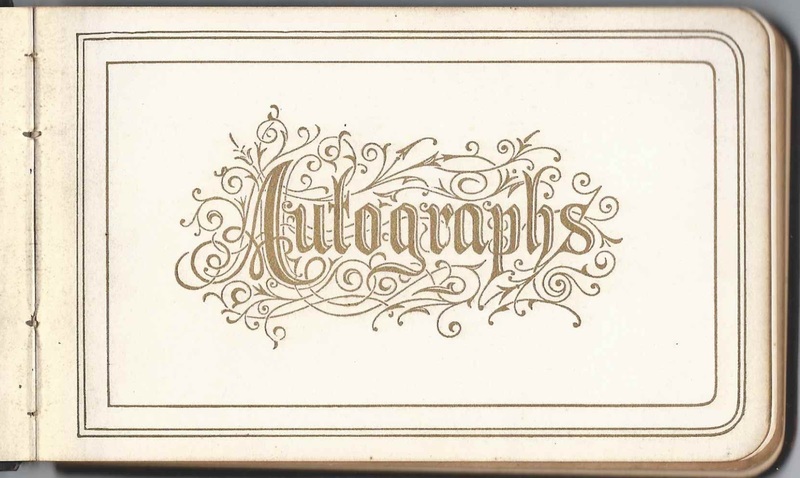 1870s/1880s autograph album that belonged to Belle Waller Tunstall of Norfolk, Virginia. 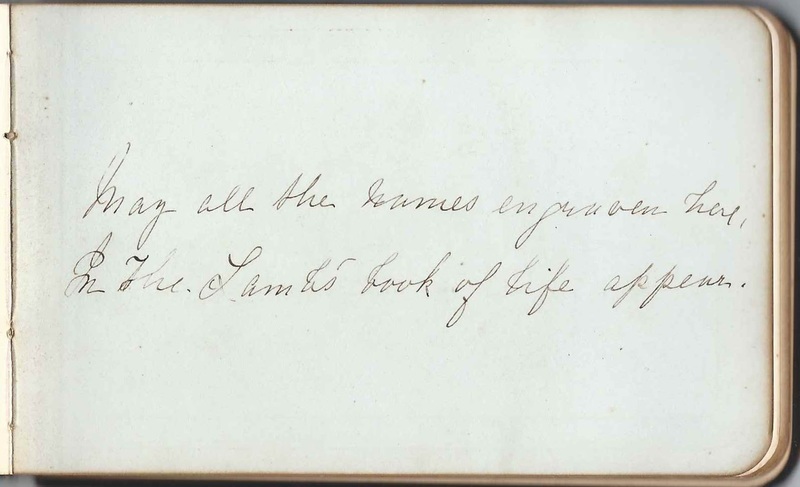 Several, perhaps many, of the pages were inscribed by officers in the United States Navy. 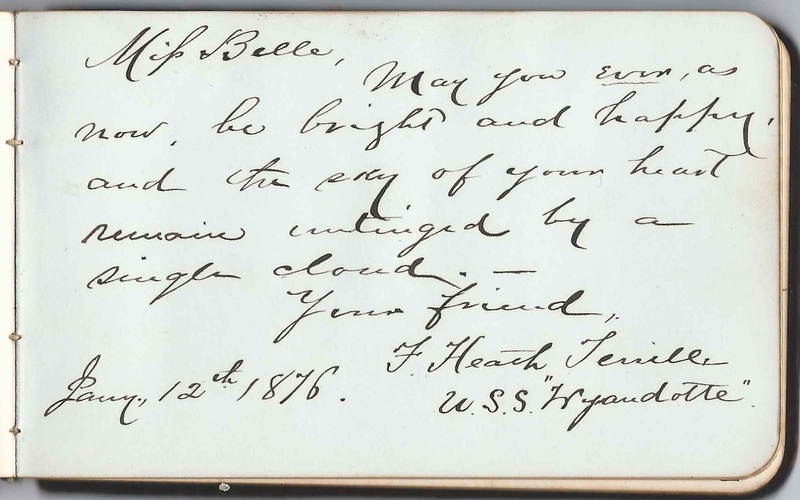 Toward the end of the album, Belle signed a page herself. 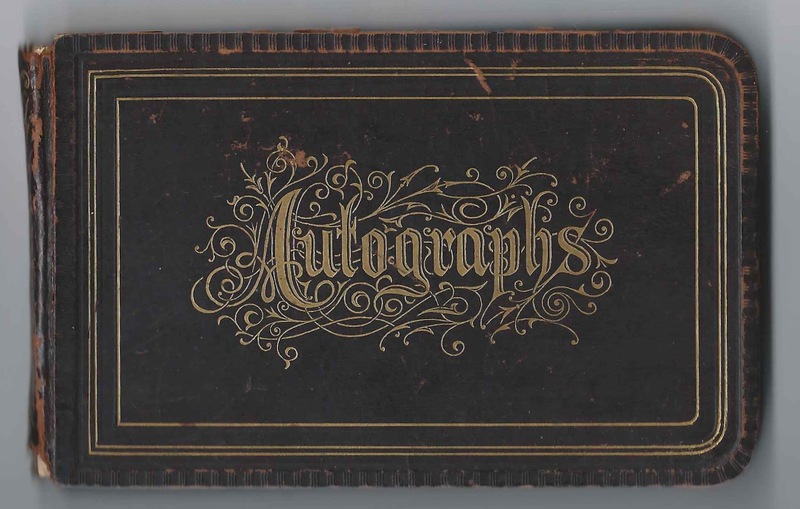 The album is approximately 5-1/4" x 3-1/4" and contains the sentiments of nearly 30 people, though some may have signed more than once. Belle Waller Tunstall was born 6 October 1856 in Virginia, the daughter of Dr. Richard Baylor Tunstall and Virginia Greenhow (Waller) Tunstall. The Waller line went back to Benjamin Waller (1716-1786), a Member of the House of Burgesses. 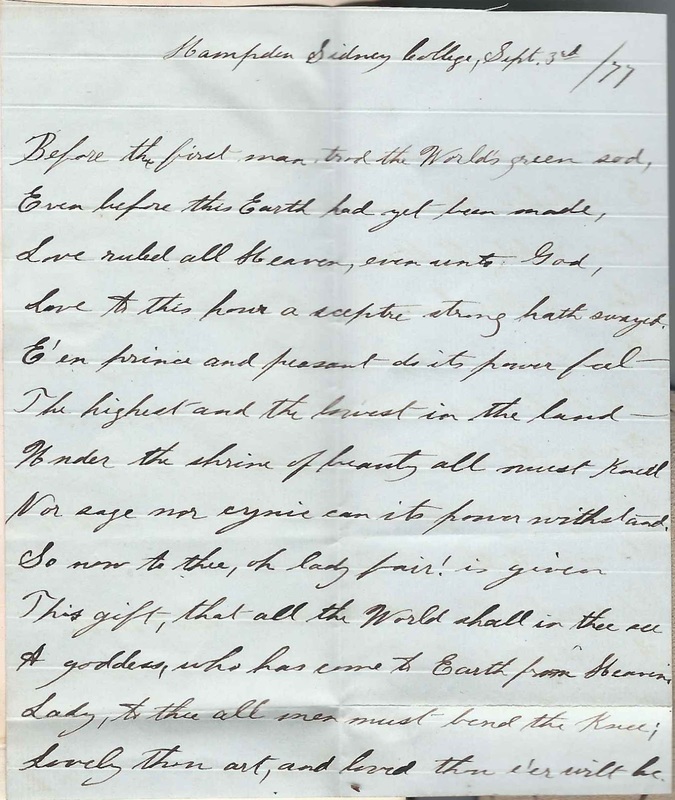 On 4 November 1896, Belle became the second wife of Dr. Frank Anthony Walke, son of John Newton Walke and, I think, Mary E. (Land) Walke. Dr. Frank's first wife, Anne Maria (Baylor) Walke, died in 1896. James ? 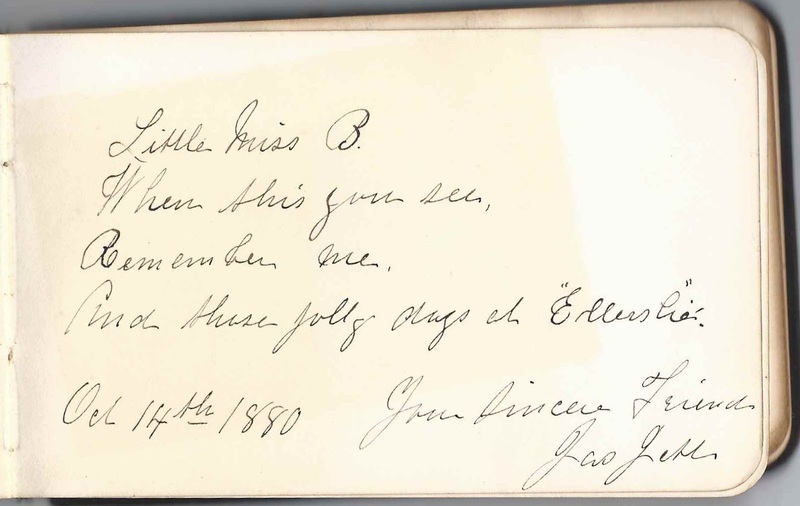 signed a page on October 14, 1880, possibly at Ellerslie, Virginia. W. H. D. drew a flower and mentioned E.O.T.I.F.D. 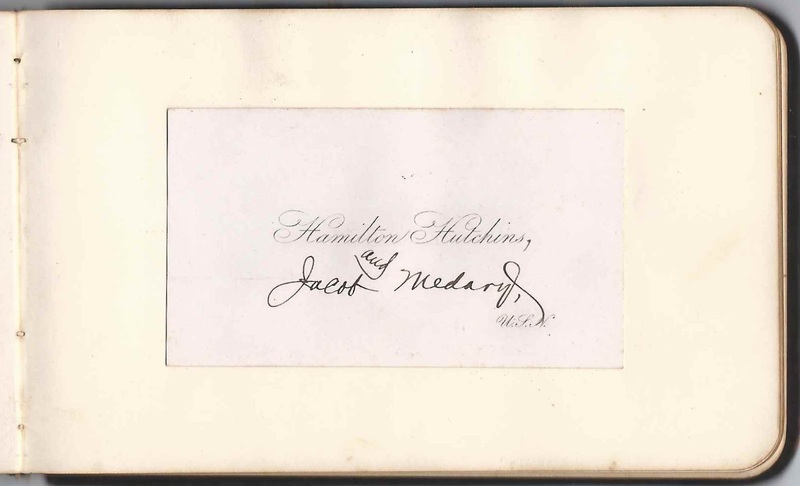 Walter S. French of the United States Navy, who served on the "Huron"
John Quinby, whose middle initial might have been G.
Belle pasted the calling card of Hamilton Hutchins of the United States Navy on a page; Jacob Medary added his name to the card. I believe the R. A. Urquhart of the U.S.S. 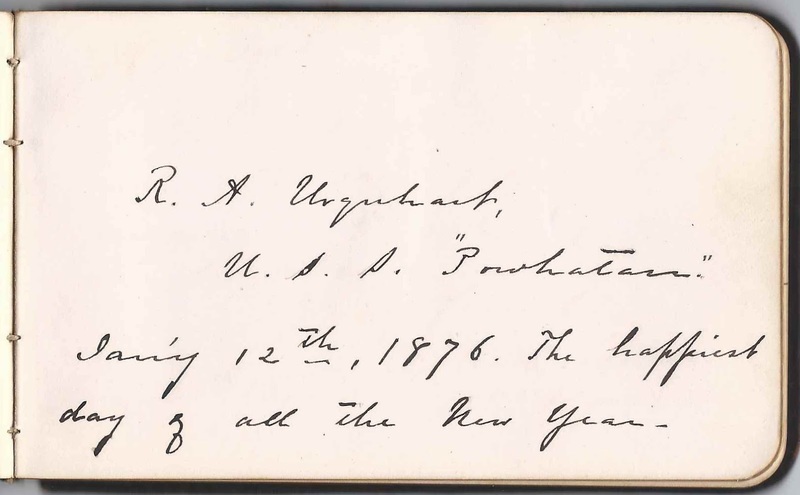 Powhatan who signed a page on January 12, 1876 was surgeon Richard A. Urquhart. F. Heath Terrill of the U.S.S. 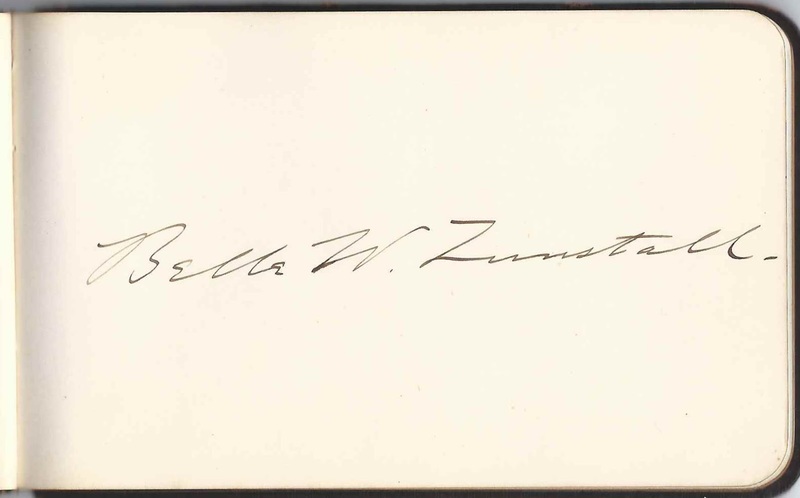 Wyandotte signed a page on January 12, 1876. Charles A. 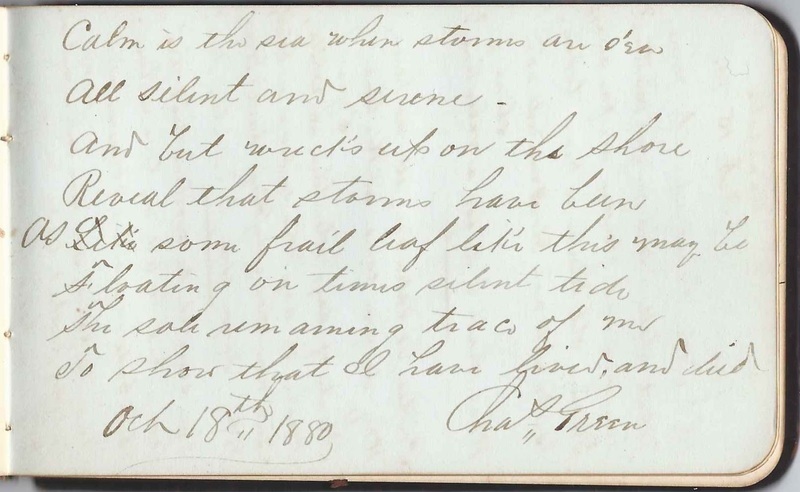 Read signed on October 16, 1880, at Ellerslie, Virginia. Charles Green signed on October 18, 1880. 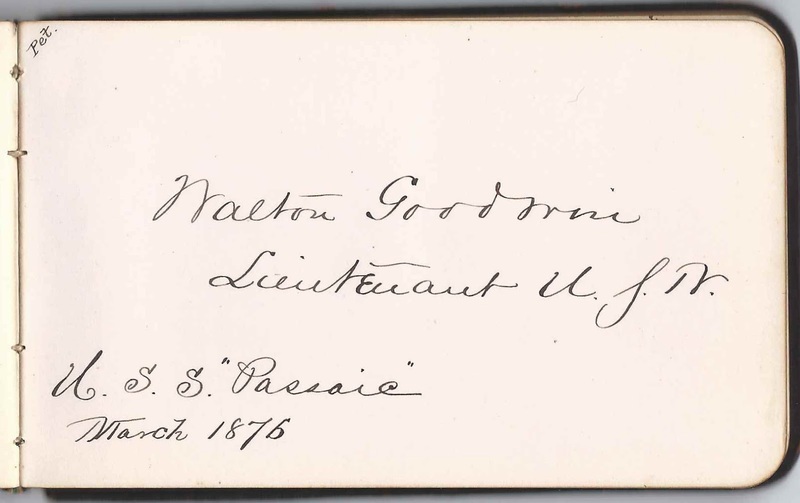 Walton Goodwin of the U.S.S. Passaic signed in March 1876. 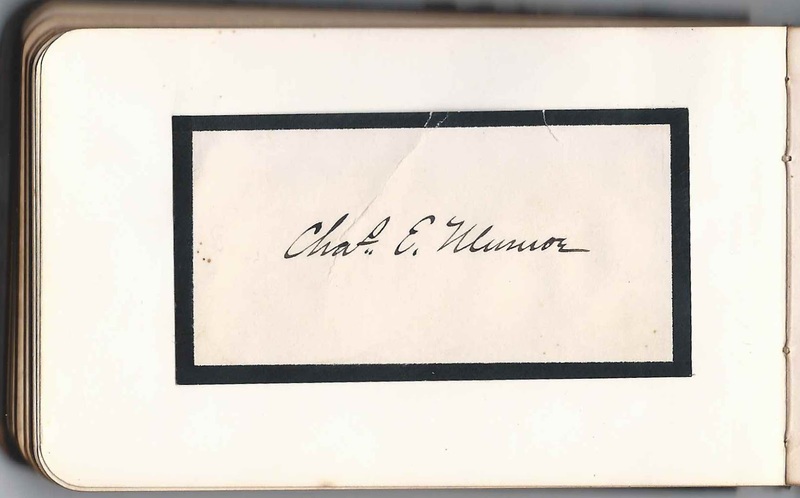 A signer, possibly with the initials W. ? B., drew a naval insignia. 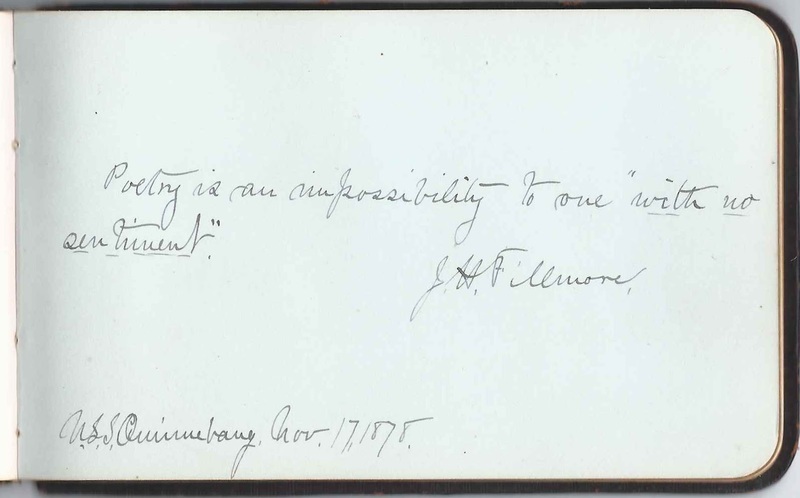 J. H. Fillmore of the U.S.S. 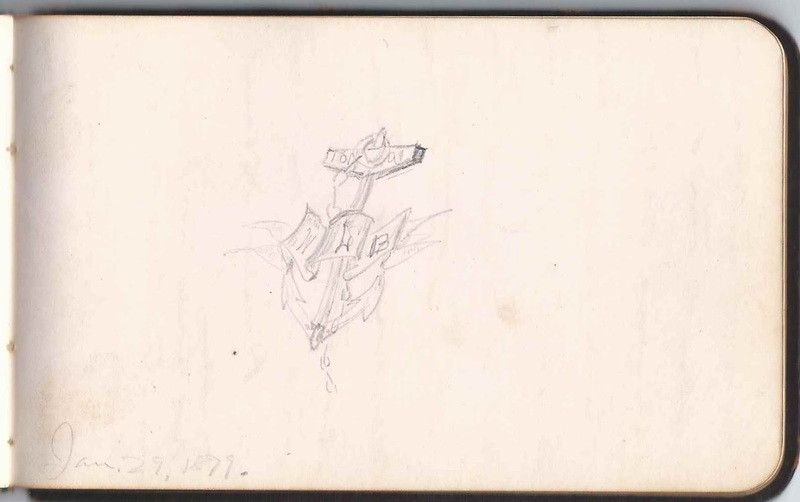 Quinnebaug signed a page on November 17, 1878. The was the second Quinnebaug, launched in 1875. 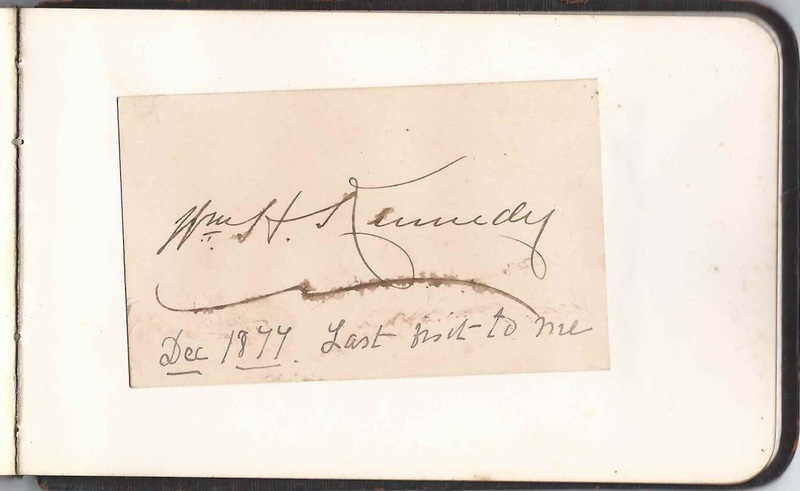 William H. Kennedy; someone, presumably Belle herself, added she acquired the card on Kennedy's last visit in December 1877. Several pages mentioned "The Shade", which may have been a gathering place in the Norfolk area. 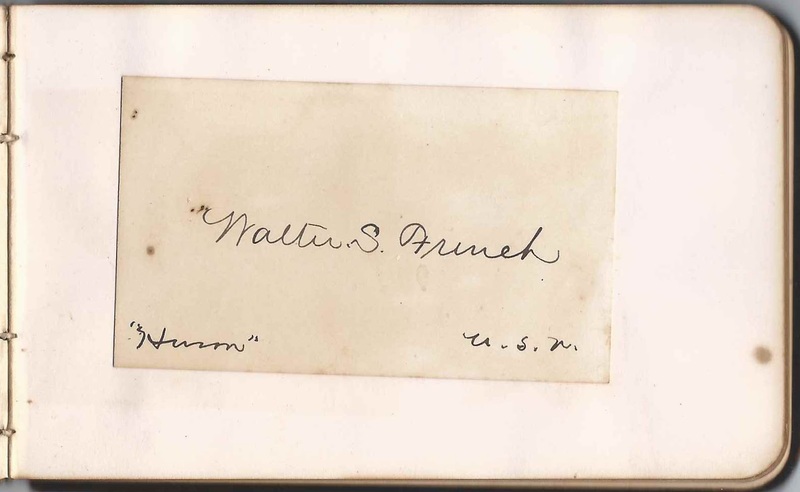 M. F. Green signed at The Shade on October 21, 1880. 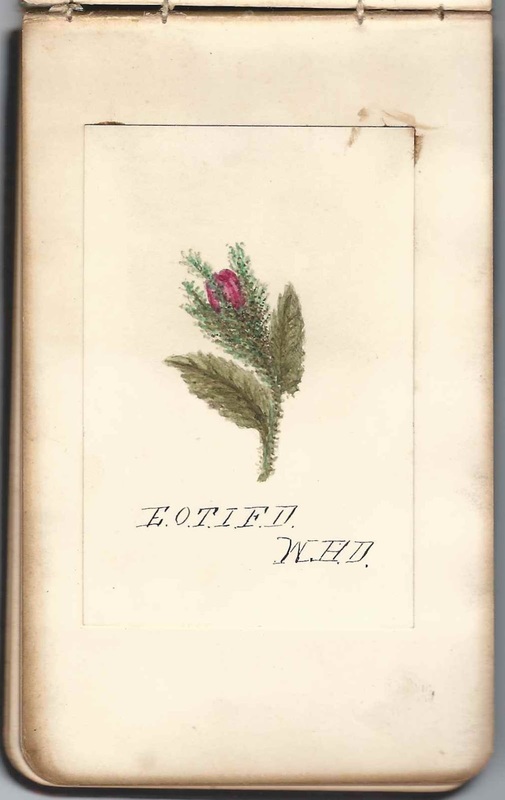 A clipping pasted inside has handwriting at the bottom which mentions The Shade. 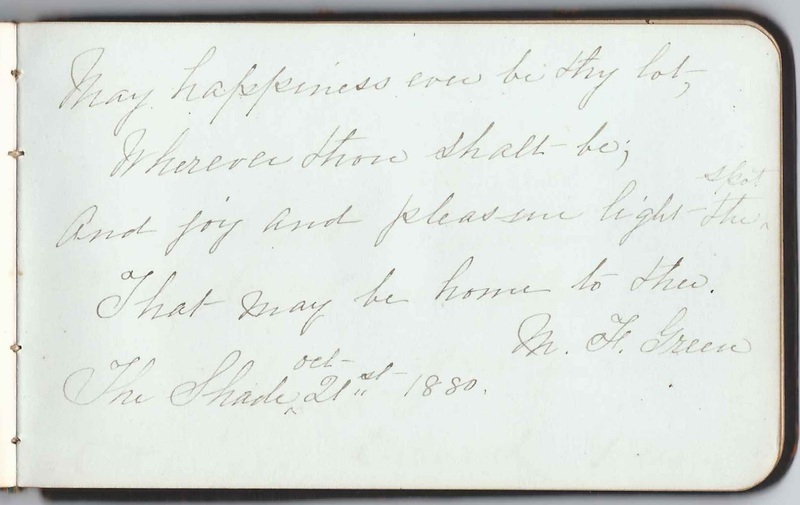 The last entry in the album is this unsigned note pasted in, written at Hampden Sidney College, on September 3, 1877. Whether the spelling was different then or not, I don't know, but it's known as Hampden-Sydney College today. 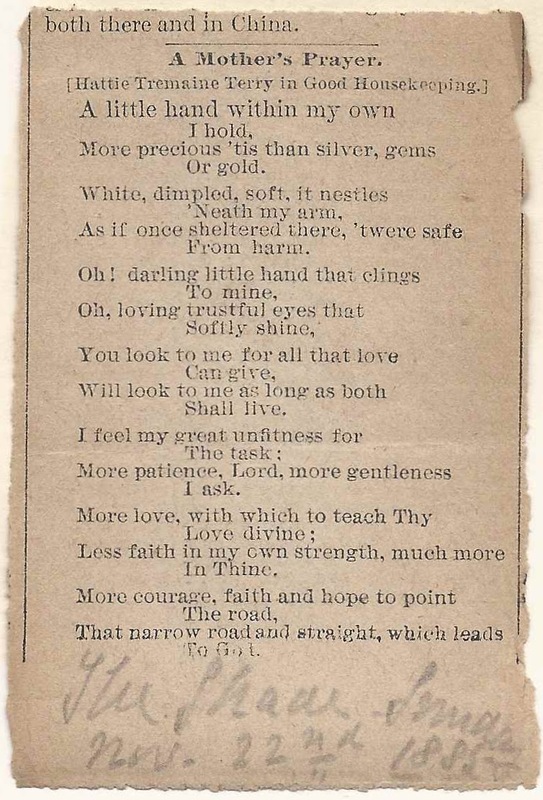 If you have corrections to the information on Belle Wallter Tunstall or her husband Dr. Frank Anthony Walke, or information on any of the signers, please leave a comment or contact me directly. Thanks! Walter S. French, on the "Huron", U.S.N. 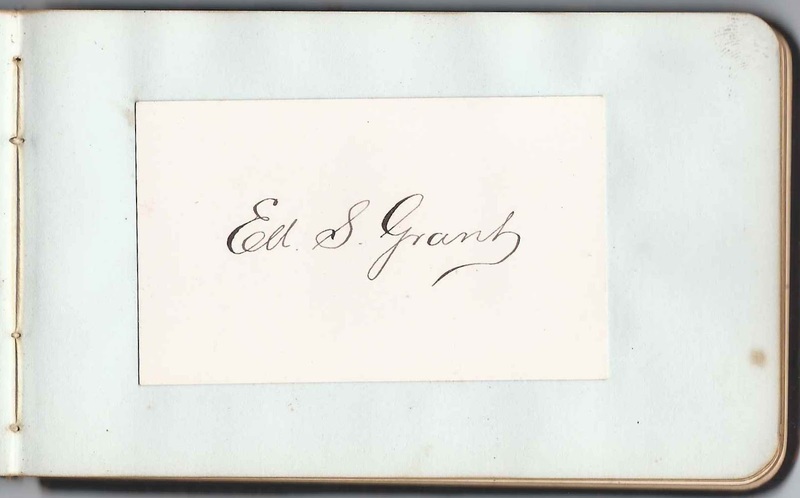 E. Green, signed at "The Shade", on October 18, 1880; "14 y.o." 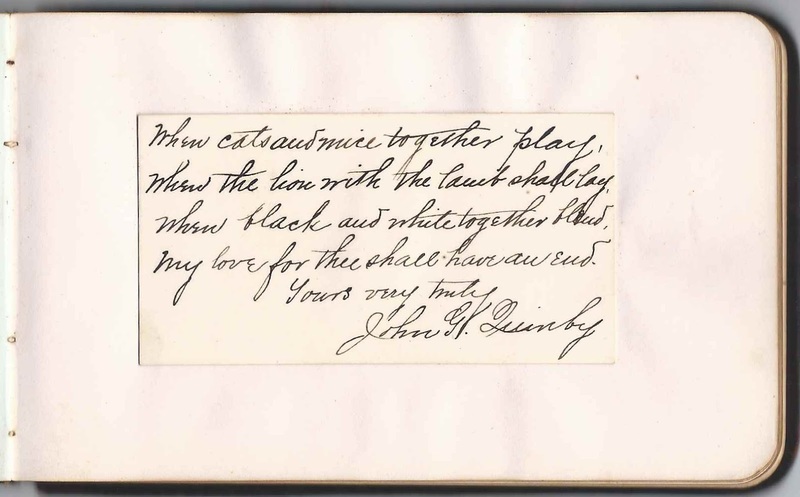 John Quinby; middle initial possibly G.